My old street directory has a section entitled Barristers-at-Law. This selective list includes judges. I wonder if any of them are still practising? This branch of the family is stated to be of Norman descent, springing from Warburton of Arley, Cheshire. RICHARD WARBURTON, of Dublin, living there in 1622, left three sons and a daughter, viz. RICHARD WARBURTON (1636-1717), was a junior Clerk of the Council, Ireland, 1654, and afterwards Clerk-Assistant to the Irish House of Commons. He was styled of Garryhinch in 1662, and was MP for Ballyshannon, 1695-1711 and 1703-13, and High Sheriff of Queen's County, 1701. Mr Warburton wedded, in 1656, Judith, daughter of William Sandes, of Dublin. JOHN WARBURTON, of Garryhinch, MP for Queen's county, 1779-94, High Sheriff, 1786. This gentleman was heir to his uncle Peter. He served in early life as a military officer, and was at the taking of Quebec, under General Wolfe. Frances Sophia; Ada Blanche; Maude Alyne. Jessie Georgina Hutchinson; Mary Anne. GARRYHINCH HOUSE, near Portarlington, was a house of early to mid-18th century appearance. It comprised three storeys with a three-bay centre recessed between two projecting one-bay wings. The doorway was pointed; a two-storey, three-bay range was at one side, set back. The former demesne is now a beautiful picturesque woodland for walking and was formerly part of the Warburton estate until it was sold in 1936. There are a number of specimen trees (remnants of ornamental plantings which adorned the big house) in the forest including monkey puzzle and lime. 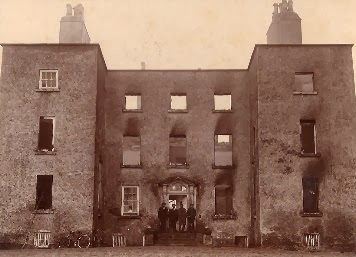 The house was accidentally burnt in 1913 and later demolished for safety reasons. Ruinous outbuildings can still be seen in the forest. There is an old, three-arched bridge crossing the Barrow. The forest is surrounded mainly by farmland. Portarlington Golf Club, which has written a good history of Garryhinch and its association with the Warburtons, lies to the north-east of Garryhinch. First published in March, 2013. Photo credits: Liam O'Malley. Few hereditary peers whose ancestral seats are in Northern Ireland maintain London homes nowadays. A hundred years ago, though, the position was different. The Duke of Abercorn: pre-1869, Chesterfield House, South Audley Street; from 1869-1915, Hampden House, Green Street; 68 Mount Street, Park Lane, 1939. The Marquess of Downshire: Downshire House, 24 Belgrave Square (1860), later the town residence of Lord Pirrie. The Marquess of Donegall: 22 Grosvenor Square (1860). The Marquess of Londonderry: Londonderry House, Park Lane. 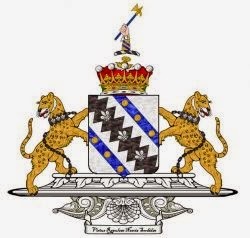 The Marquess of Dufferin and Ava: 75 Cadogan Square. 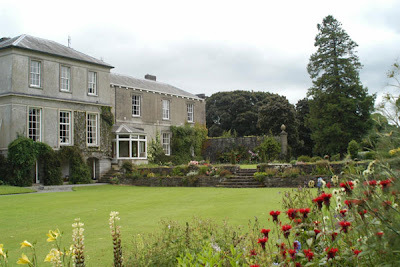 The Earl of Roden: No address found other than Tollymore Park, Bryansford, co Down. The Earl of Clanwilliam: 36 Draycott Place. The Earl of Antrim: No address other than The Castle, Glenarm, Co Antrim. The Earl Annesley: 25 Norfolk Street, Park Lane (1860). 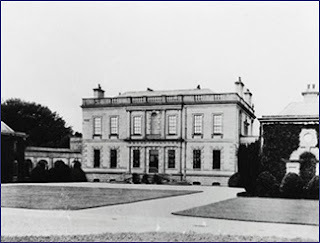 The Earl of Enniskillen: No address other than Florence Court, Co Fermanagh. The Earl of Erne: 21 Knightsbridge. The Earl of Belmore: 56 Eaton Place (1860). The Earl Castle Stewart: No Address other than Stuart Hall, Stewartstown, Co Tyrone. The Earl of Caledon: No Address other than the Castle, Caledon, Co Tyrone; Derg Lodge, Co Tyrone; Tyttenhanger, St Albans, Hertfordshire. The Earl of Gosford: 22 Mansfield Street. The Earl of Kilmorey: 5 Aldford Street, Park Lane. The Earl of Ranfurly: 33 Lennox Gardens. The Lord de Ros: 22 Wellington Court, Knightsbridge. I couldn't resist posting this nostalgic advertisement placed the in the 1974 street directory. We frequently sailed to Liverpool on these ships. They were very popular in Northern Ireland. I seem to recall that it took ages for the ferries to negotiate the series of docks at Liverpool! 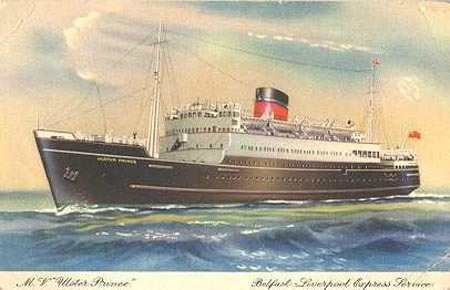 Do any readers have memories of their voyages in the MV Ulster Prince or MV Ulster Queen? I believe there was an MV Ulster Monarch, too. 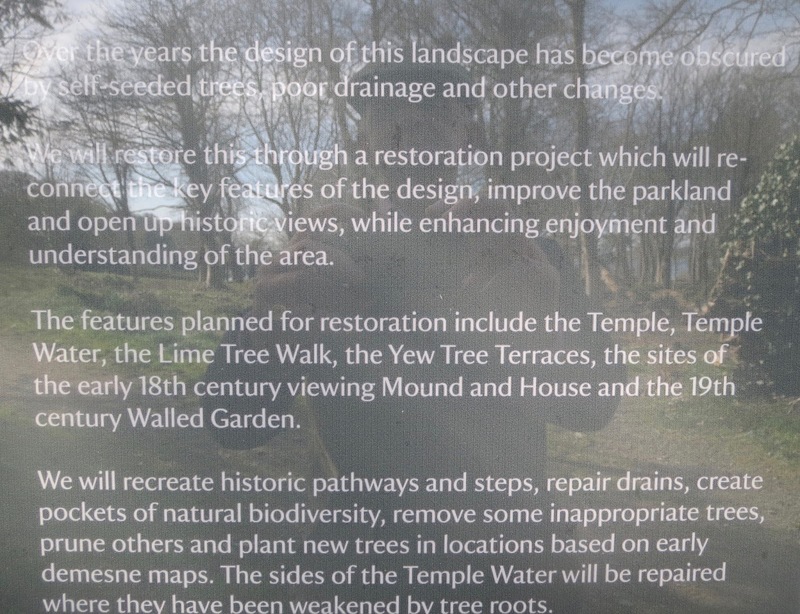 Eager to see the National Trust's admirable and worthy Temple Water project, I motored down to Castle Ward on Sunday, 26th March, 2017. Castle Ward, ancestral seat of the Viscounts Bangor, is located near Strangford, County Down. I drove to the farmyard, though there no longer seems to be visitor parking there; so, instead, I parked at the relatively new Shore Car Park at Strangford Bay. Thence I walked towards the Temple Water, a man-made lake on an axis with Audley's Castle. It's also beside the old walled garden and overlooked by The Temple, a Georgian summer-house on the top of the hill with a splendid, panoramic prospect of the landscape. The National Trust has ambitious plans for this part of the demesne, viz. to restore the Georgian parkland and the Temple Water itself. 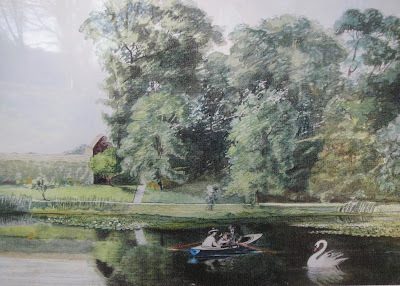 I walked up to the Temple; down and along the lake; and past the Green row of terraced cottages which overlook Audley's Castle. Eventually I walked back to the Shore car-park. I took my packed-lunch up to the stable-yard, where I enjoyed the Spring sunshine on a bench. At the shop, I purchased a "sit mat"; and across the stable-yard I bought a few books in the excellent second-hand bookshop (Ballywalter Park, UAHS, and St Patrick's (anglican) Cathedral, Armagh). I had made myself fresh egg and onion sandwiches (County Fermanagh egg, red onion, mustard, cream cheese, granary wholemeal bread). After lunch I made a beeline for the mansion-house, where I took a tour. My afternoon concluded in Strangford, about a mile from Castle Ward, where I had a stroll round the village. The Lobster Pot is back in business, across the Square from The Cuan restaurant and guest-house. This noble family was originally of the counties of Somerset and Northamptonshire. HUGH CUFFE, Secretary to the Earl of Essex, had a grant, during the reign of ELIZABETH I, of 6,000 acres of land in County Cork, and settled at Cuffe's Wood. He left, at his decease, two daughters, his co-heirs; viz. Elizabeth, married to Sir Francis Slingsby; and Dorothea, to Sir Charles Coote. JOSEPH CUFFE, having joined the army under Cromwell, in 1649, was rewarded for his services by considerable grants of lands. He wedded Martha, daughter of Colonel Agmondesham Muschamp, by whom he had no less than twenty children. The second son, Maurice, was of Cuffesborough, in Queen's County. AGMONDESHAM CUFFE, who was attainted by JAMES II's parliament, in 1689, and had his estates sequestered; but was restored by WILLIAM III. JOHN CUFFE, of Desart, County Kilkenny, MP, who was elevated to the peerage, in 1733, by the title of Baron Desart. His lordship married firstly, Margaret, only daughter and heir of James Hamilton, of Carnesure (descended from the Hamiltons, Earls of Clanbrassil), but had no issue. Nichola Sophia; Lucy Susanna; Martha; Margaretta; Catherine. OTWAY, 3rd Baron (1737-1804), who was advanced to a viscountcy, as Viscount Castle Cuffe in 1781; and further advanced, in 1793, to the dignity of an earldom, as EARL OF DESART. He wedded secondly, in 1881, Ellen Odette, daughter of Henri Louis Bischoffsheim, though had no further issue. HAMILTON JOHN AGMONDESHAM (1848-1934), 5th and last Earl, KP, KCB, PC. In his early life he was a midshipman in the Royal Navy before becoming a barrister in 1872. In 1877, he was appointed as a secretary to the Judicature Committee and as a solicitor to The Treasury a year later. In 1894, he was appointed a Companion of the Order of the Bath and as Treasury Solicitor that year, as well as Queen's Proctor and Director of Public Prosecutions. On inheriting the earldom of Desart from his elder brother William (who died without heirs male) in 1898, he was promoted as a Knight Commander of the Order of the Bath. In 1909, the 5th Earl was created Baron Desart in the Peerage of the UK, which enabled him to sit in the House of Lords. In 1913, he was sworn of the Privy Council and appointed a Knight of St Patrick in 1919, one of the last appointees to the Order. The 5th Earl was the last Lord-Lieutenant of County Kilkenny, 1920-22. 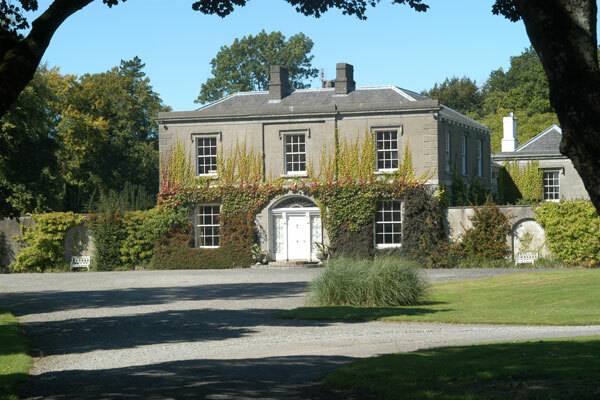 DESART COURT, near Callan, County Kilkenny, was a Palladian house of two storeys over a basement, joined to two two-storey wings by curved sweeps. It was built about 1733 by 1st Baron Desart. The centre block had a seven-bay front, its main feature being four superimposed, engaged, Doric and Ionic columns and Doric entablature. The drawing-room, in the centre of the garden front, had a ceiling of rococo plasterwork, similar to the hall. Desart Court was burnt in 1923, though was afterwards rebuilt by Lady Kathleen Milborne-Swinnerton-Pilkington, daughter of the 4th Earl. In 1957, the house was sold and finally demolished. First published in March, 2013. Desart arms courtesy of European Heraldry. CAPTAIN JAMES WRIGHT (1615-1700), of Royston, Yorkshire, son of John Wright and Margaret, daughter of Richard Ratcliffe. This soldier, an officer in Cromwell's army, landed at Dublin, 1649. In 1661, Captain Wright was granted lands at Golagh in County Monaghan. He was, however, attainted by JAMES II's parliament, 1688. JOSEPH WRIGHT, of Golagh, High Sheriff of Monaghan, married, in 1744, Eleanor Martyn, of Clogher and Dumbartagh, County Cavan. 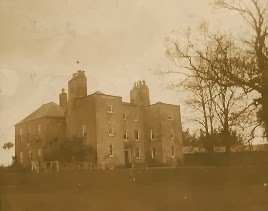 JOSEPH WRIGHT JP, of Carrachor Hall, Rector of Killencoole, Lurgan Green and Harristown, County Louth, married Mary Montgomery and had four sons. RICHARD WRIGHT, of Fortfield, Belfast, and Craigavad House, County Down, married Catherine, daughter of George Dowdall. He died in 1788, leaving issue five sons and two daughters. EDWARD THOMAS WRIGHT (1810-81), of Donnybrook, County Dublin, Barrister, married, in 1832, his cousin Charlotte, daughter of Joseph Wright, of Beech Hill, Donnybrook, County Dublin. EDWARD PERCIVAL WRIGHT (1834-1910), Professor of Botany, Dublin University, married Emily, daughter of Colonel Ponsonby Shaw of the Indian Army. THE REV CHARLES HENRY HAMILTON WRIGHT (1836-1909), married, in 1859, Ebba Johanna, daughter of Nils Wilhelm Almroth (Director of the Royal Mint in Stockholm and a Knight of the Northern Star of Sweden). SIR ALMROTH EDWARD WRIGHT KBE CB (1861-1947), married, in 1889, Jane Georgina, daughter of Robert Mackay Wilson, of Coolcarrigan, County Kildare. Janet, (b 1951) who married Sir Richard La Touche Colthurst, 9th Baronet, of Ardrum, County Cork, and had issue two sons, Charles (b 1955) and James (b 1957). THE WILSONS descend from John Wilson, of Rahee, County Antrim, said to have landed in Carrickfergus in the suite of WILLIAM III. Robert Mackay Wilson's great-grandfather Hugh Wilson (d 1822) also lived at Rashee. Robert Mackay Wilson's grandfather William Wilson, of Daramona House, County Westmeath, and Larkhill, County Dublin, was born in 1787 and married, in 1815, Rebecca Dupre (d 1846), daughter of John Mackay of Elagh, County Tyrone, and Prospect, County Londonderry. Robert's elder brother John (1826-1906) succeeded to Daramona House and was sometime High Sheriff for counties Westmeath and Longford. Robert Mackay Wilson JP (b1829), High Sheriff of Kildare, 1887, married, in 1858, Elizabeth, daughter of Murray Suffern, of Belfast. Jane Georgina Wilson (1860-1926) who married Sir Almroth Wright. COOLCARRIGAN HOUSE, near Naas, County Kildare, is a mansion of three bays and two storeys in the Georgian style, built in the 1830s by Robert Mackay Wilson to the designs of an unknown architect. The façade has hooded moldings over the upper windows, a simple parapet and a typical late-Georgian door with fanlight and sidelights, while the central bay is treated as a breakfront by the addition of a pair of pilasters. Two later curved screen walls, ending in tall piers, project outwards to either side of the entrance front and disguise the fact that the house has been considerably enlarged at the rear. These additions make Coolcarrigan a very comfortable family home. 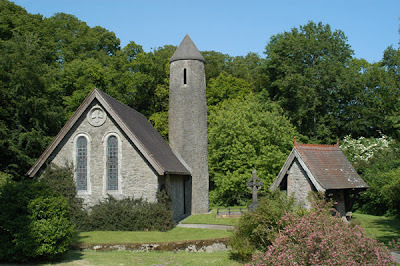 Consecrated in 1885 by the Most Rev William Plunket, Lord Archbishop of Dublin and later 4th Baron Plunket, the chapel was built in the Hiberno-Romanesque Revival style, with a Round Tower and a High Cross. It derives from the 12th century Temple Finghin at Clonmacnoise on the River Shannon. This tiny complex, surrounded by trees and a dry moat, is the most complete example of the Celtic Revival style in Ireland and makes an attractive view from the house. The church interior has frescoes in Gaelic script, specially chosen by Douglas Hyde, the first Irish President and a close family friend; while the very good stained glass windows, dedicated to various members of the family, are also in the Celtic Revival style. The main avenue has a splendid display of spring bulbs while the superb twenty-acre garden has a wonderful collection of rare and unusual trees and shrubs inspired by Sir Harold Hillier, the great 20th century plants-man and collector. An elaborate 1900s greenhouse in the walled garden has just been authentically restored. Robert Wilson's daughter Georgina married Sir Almroth Wright, and inherited Coolcarrigan. Her husband was an eminent physician and a colleague of Alexander Fleming, who worked on the development of vaccination and discovered the cure for typhoid. Among his friends was the playwright George Bernard Shaw, whose play The Doctor’s Dilemma is based upon Sir Almroth. Their descendants, the Wilson-Wright family, still live at Coolcarrigan, the fifth generation to live in the house. First published in March, 2013. VICTOR COATS (1760-1822), of Snugville, Belfast, son of Israel Coats, of Falls Road in the same town, by his wife Grace (née Harris), carried out business as a surgeon-barber and perfumer. Coats has for sale a good assortment of butter crocks and milk pans of different sizes. Also, flooring tiles of remarkable good quality, and chimney pots made to any shape. About 1800, Mr Coats inherited a heavy engineering firm, which was to become one of the most successful in Belfast. WILLIAM FREDERICK COATES JP DL (1866-1932), Lord Mayor of Belfast, 1920-22 and 1929-30, High Sheriff of Belfast, 1906, High Sheriff of County Antrim, 1931. Mr Coates established the stockbrokers William F Coates & Co. He was created a baronet in 1921, denominated of Haypark, City of Belfast. He hosted King George V and Queen Mary when they visited Belfast to open the new NI Parliament Buildings of which he was also a senator (both ex officio as Lord Mayor and as an elected member 1924-29). 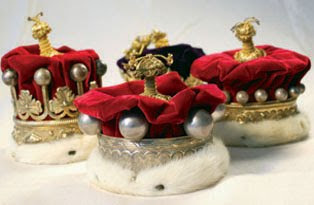 The KING has been graciously pleased on the occasion of the opening by His Majesty of the Parliament of Northern Ireland to signify his intention of conferring a Baronetcy of the United Kingdom on the undermentioned: — William Frederick Coates, Esq., D.L. For two years successively Lord Mayor of Belfast. Has rendered conspicuous valuable service during very anxious times. 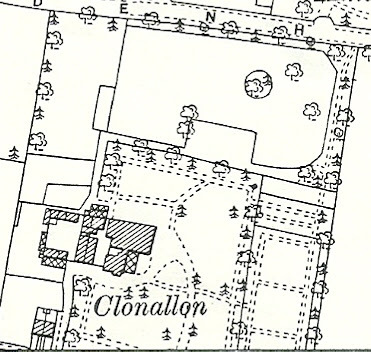 Clonallon House was a large Victorian villa in its own grounds, between Belmont Road and Sydenham Avenue. The main entrance was probably at Belmont Road, where there may have been a gate lodge. 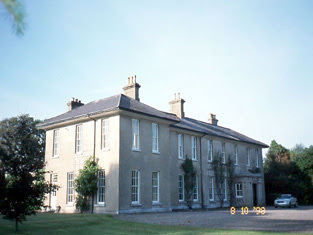 Sir William lived for a period at Glynn Park House (above), near Carrickfergus, County Antrim, which features in Dean's Gate Lodges of Ulster. Elizabeth Sara Ann; Moira Louise. Robert Lewis Edward, b 1980. Sir David is vice-president of the Poole Maritime Trust. CORNELIUS or CONNOR McGILLYCUDDY was born ca 1580; died by shipwreck, 1630, having married firstly, Joan, daughter of the Rt Rev John Crosbie, Lord Bishop of Ardfert; and secondly, Sheelagh, daughter of Richard Oge McCarty, of Dunguile, by whom he had a son, Niell, and a daughter. DONOUGH McGILLYCUDDY (1623-c1695), of Carnbeg Castle, County Kerry, Sheriff of County Kerry, 1686. This Donough obtained a grant of arms from Sir Richard Carney, Ulster King of Arms, in 1688. Daniel, Colonel, Captain Monck's Regiment; father of DENNIS. Charity; Mary Anne; Margaret; Ruth; Avis; Agnes. RICHARD McGILLYCUDDY (1750-1826), of The Reeks, High Sheriff of County Kerry, 1793, espoused, in 1780, Arabella Mullins, daughter of Thomas, 1st Baron Ventry. RICHARD McGILLYCUDDY (1790-1866), of The Reeks, who married firstly, in 1814, Margaret (d 1827), only daughter of Dr John Bennett, and had issue, a daughter, Dorothea. Agnes; Anna Catherine; Mary Ruth; Sylvia Emily. THE REEKS, near Beaufort, County Kerry, is a two-storey, five-bay, late Georgian house. It has an eaved roof and pilastered porch, doubled in length with an extension of the same height and style. Effectively this forms a continuous front of ten bays, the original porch, no longer central, remaining the entrance. The two end bays of the extension protrude slightly. AT THE end of the 19th century, before the Land Purchase Acts, Richard McGillycuddy's grandfather, whose mother had injected American money into the family, distinguished himself in the 1st World War, winning the DSO and the Légion d'Honneur. From 1928 to 1936, he sat in the Senate of the Irish Free State as a supporter of the moderate WT Cosgrave and an opponent of the republican Eamon de Valera. In the 2nd World War, he returned to the colours and became a regular informant on what was happening in neutral Ireland. His grandson, Richard Denis Wyer McGillycuddy, was born in 1948. Richard's father, the senator's son, who had succeeded in 1950, himself died in 1959 as a result of wounds sustained during the 2nd World War in the Northampton Yeomanry. At the time Richard was only 10 and still at his preparatory school before going on to Eton. His English mother, although never feeling at home in Ireland, carried on dutifully at Beaufort to preserve the family inheritance for her son. Every August, she organised a rather gentrified cricket match played on the lawn of the house - but it was abandoned around 1970 after young Richard, who had little interest in cricket and was not watching, was knocked unconscious by a mighty drive by a visitor who had played for the Cambridge Crusaders. The young McGillycuddy's passion was cars, and he went into the motor trade in London after a brief sojourn at the University of Aix-en-Provence. He was unreceptive to the efforts of his uncle Dermot, a Dublin solicitor much beloved of McGillycuddys of every class and creed, to interest him in Ireland. Tall and dashing, the rugged and auburn-haired young McGillycuddy of the Reeks was much in demand in London among the Sloane Rangers. Eventually, in 1983, at the age of 35, he married Virginia Astor, the granddaughter of the 1st Lord Astor of Hever. 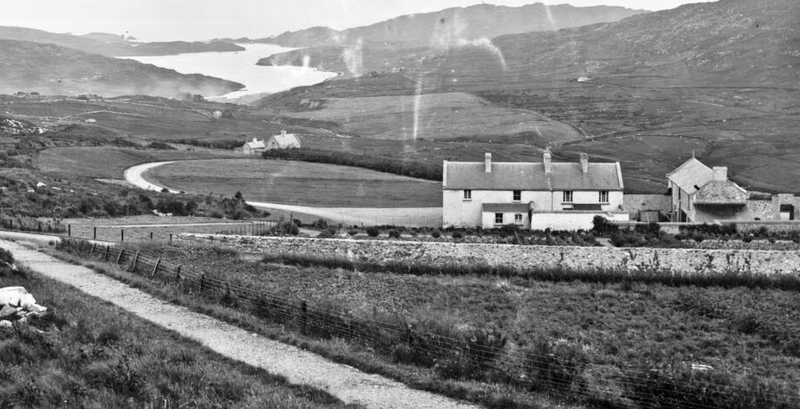 Feeling that he had little in common with the local people in Kerry, McGillycuddy decided to sell The Reeks, and moved to France, where he acted as a property consultant to prospective British purchasers of chateaux and lesser French properties. After the birth of his second daughter in 1990, the family returned to live in Ireland - not, however, in their ancestral territory, but nearer Dublin, where they rented a succession of houses, the last of them in Westmeath. He continued to dabble in property, and latterly sold insurance; but it was a handicap that his upper-class English demeanour disappointed expectations raised by his Irish-sounding name. Although he could be charming in the appropriate company, he did not relate well to Irish people outside his own class. Meanwhile, despite poor health, his wife carved out a niche for herself doing valuable work as a prison visitor. McGillycuddy was active in the council of Irish chieftains who had been recognised by the Irish Genealogical Office. Richard McGillycuddy was survived by his wife and two daughters. He was succeeded by his first cousin, Donogh, who lives in South Africa. For the benefit of those of you who don't follow me regularly, I happened to be digging and shovelling at a little wood beside Greyabbey, County Down, during the week. This wood is owned by the National Trust. I was chatting with a fellow volunteer about a favourite topic, viz. food, and he apprised me of a certain brand of vegetarian sausages. Geoff's wife and daughter are both vegetarian, though he is not. 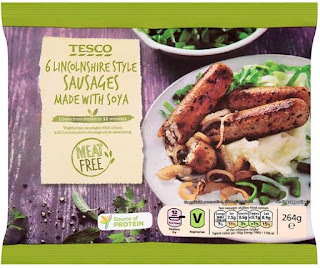 However, he recommended Tesco Meat-Free Lincolnshire-style Sausages. They are in the freezer section and are sold in packs of six. Dear readers, I am not vegetarian. I had a home-made rump steak burger several days ago. However, I am not averse to trying healthy alternatives to pork sausages. Accordingly, I purchased a packet of the said sausages. I fried them gently in butter, fried a finely-chopped red onion, and boiled a few potatoes. I had these veggie sausages with onion mash, tomato, and my home-made coleslaw. I will understand if some of you are sceptical when I tell you that these veggie sausages are as close in texture and flavour to the real thing. I have consumed Quorn sausages, and the Tesco Lincolnshire-style ones are considerably better. I am convinced that I could fool a few pals if I presented these bangers to them in a blind tasting. In conclusion, readers, you must try them for yourselves and please do let me know what you think. The direct ancestor of this family was SIR ROBERT BAGOD, born in 1213, Chief Justice of the Irish Common Pleas, 1274, who obtained a grant of the manor of The Rath, near Dublin (known today as Baggotrath; and also the lands of Baggotstown in County Limerick. Sir Robert died after 1298. EDWARD BAGOT (1620-1711), of Harristown, King's County, and Walterstown, County Kildare, was a Royal Commissioner for King's County, 1663, and High Sheriff of Kildare, 1677, and King's County, 1680. JOHN LLOYD BAGOT, of Ard and Ballymoe, Captain in the 37th Foot, and ADC to Lord Cornwallis during the American war, wedded, in 1775, Catherine Anne, daughter of Michael Cuffe, of Ballymoe, a descendent of James, Lord Tyrawley, and of Elizabeth Cuffe, alias Pakenham, created Countess of Longford. MILO VICTOR NEVILLE-BAGOT (1880-), of Ballymoe and Aughrane, and Turin, Italy, who married, in 1908, Maria, only daughter of Signor Boccacio, of Turin, Italy, in a childless marriage. AUGHRANE CASTLE (or Castle Kelly), near Ballygar, County Galway, was a castellated house of 19th century appearance. It had small bartizans at the corners; plain windows with hood mouldings; and a simple, battlemented porch. There was a gabled range at one end; a gabled tower behind. It is said that the Bagot family played a very passive role in the life of the area, other than to collect rents due. Christopher Bagot spent very little time on the estate and left the management to his two brothers, Charlie and John. Christopher Bagot bought a house in a fashionable part of London, and entertained fairly lavishly. Through these parties he came to know a young society lady of great charm and beauty called Alice Verner. Within a short time they were married – believed to be in 1874. In due course a son was born to them. Mrs Christopher Bagot continued to have a high life and relations between herself and her husband soon became strained. 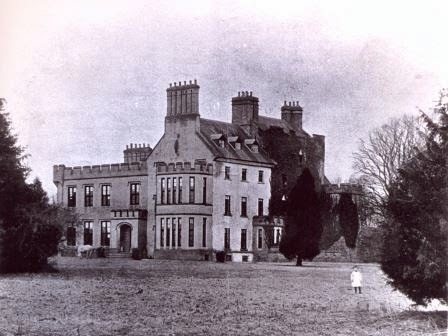 They returned to Castle Kelly in 1876, and some time later he banished her and their young son from his home. He subsequently drew up a will leaving his entire estate to his brother, John Bagot. His health failed rapidly and he died in 1877. Mrs Bagot contested the last will made by her husband, and a much-publicised trial ensued at the Probate Court in Dublin. The trial lasted for a month, and the court found in favour of Mrs Bagot and her son. The Court administered the estate on their behalf until the young heir came of age. The entire estate was offered for sale in 1903. The Irish Land Commission was the purchaser, and later the Irish Forestry Commission acquired Castle Kelly and the 1,600 acres surrounding it. 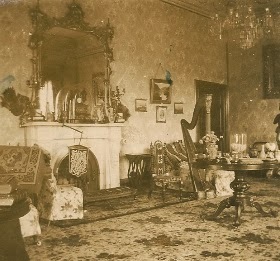 The house was demolished in 1919. 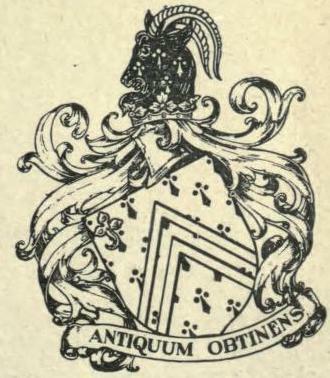 THOMAS COBBE, of Swarraton, born ca 1510, living at the time of the Visitation of Hampshire, 1575, when he received from Robert Cooke, Clarenceux King-of-Arms, a ratification of the "armes and chriests of his ancestors." 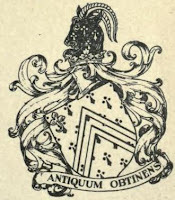 By his second wife, Agnes, daughter of John Hunt, Thomas Cobbe was father of Richard, BD, Fellow and Vice-President of Corpus Christi College, Oxford, and one of its earliest benefactors; also of two other sons, joint possessors of the Northington estate, adjoining Swarraton. THOMAS COBBE, of Swarraton, 1575, Captain of a foot company, 1634, who married Catherine, daughter of the Ven Owen Owen, Archdeacon of Anglesey and Rector of Burton Latimer, sister of John Owen, Bishop of St Asaph. THE MOST REV AND RT HON CHARLES COBBE (1686-1765), successively Lord Bishop of Killala, Dromore, and Kildare, and Lord Archbishop of Dublin, married Dorothea, daughter of the Rt Hon Sir Richard Levinge Bt, Speaker of the House of Commons, and Chief Justice of Common Pleas in Ireland, widow of Sir John Rawdon Bt, of Moira. THOMAS COBBE (1733-98), of Newbridge, MP for Swords, 1759-83, Colonel of Militia, who wedded, in 1751, the Lady Eliza Beresford, daughter of Marcus, 1st Earl of Tyrone, and sister of George, Marquess of Waterford. CHARLES COBBE JP DL (1811-86), of Newbridge, High Sheriff of County Dublin, 1841, County Louth, 1867, who married firstly, in 1839, Louisa Caroline, daughter of George Frederick Brooke, of Summerton, County Dublin; and secondly, in 1883, Charlotte, daughter of the Rev Henry Moore, of Julianstown Rectory, County Meath. Janet Corrine; Vereana Estelle Beresford. THOMAS LEURIC COBBE (1912-84), of Newbridge. 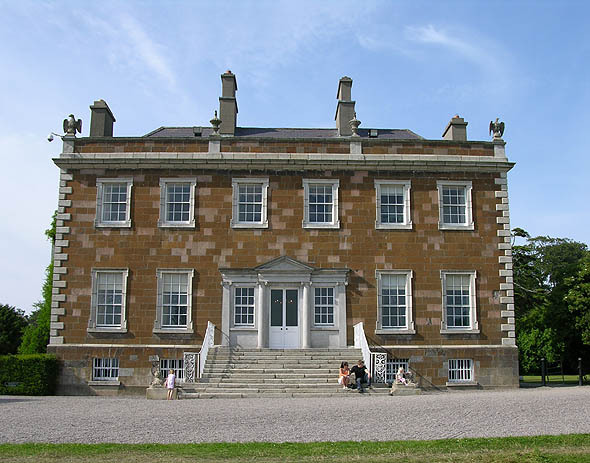 NEWBRIDGE HOUSE, near Donabate, County Dublin, was built ca 1737 by Richard Castle for Dr Charles Cobbe, later Lord Archbishop of Dublin. It consists of two storeys over a high basement. The ashlar entrance front is of six bays, with a tripartite, pedimented door-case. There is a broad flight of steps up to the hall door; while the solid roof parapet has urns, with eagles at the corners (not swans!). Shortly after the Archbishop's death in 1765 his son, Colonel Thomas Cobbe MP, whose wife was Lady Elizabeth Beresford, added an enormous drawing-room and a picture gallery to hold the extensive collection of Old Master paintings. This room, forty-five feet long, was given a Rococco ceiling. 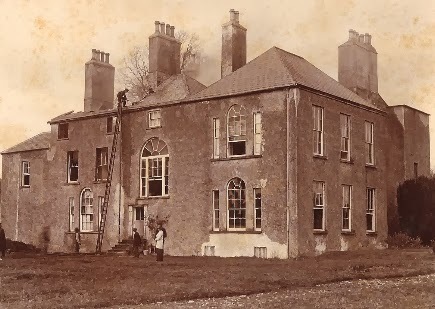 In the Red Drawing Room, added by them, they lavishly entertained and hung many of their superb pictures, purchased on their behalf by the incumbent of Donabate Church, the Rev Matthew Pilkington, who was well qualified to buy on their behalf, as it was he who composed the first major English Dictionary of Painters. Their eldest son Charles died in 1770, and the eldest grandson, also Charles, became heir apparent. He joined the army, served in India and returned to Bath in 1805. Four years later he married Frances Conway and immediately went to live at Newbridge where he carried out much refurbishing with the aid of his wife's wealth. 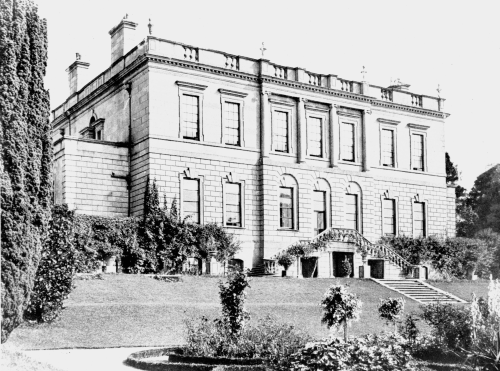 It appears that, during the family's absence in Bath, the estate had become run down. Charles' considerable energies were used to build it up again. He threw down the "wretched mud cabins" occupied by his tenants and built new houses on his estate which were paid for be the sale of some of the family's most prized paintings, viz. The Gastor Poussin and a Hobbema. 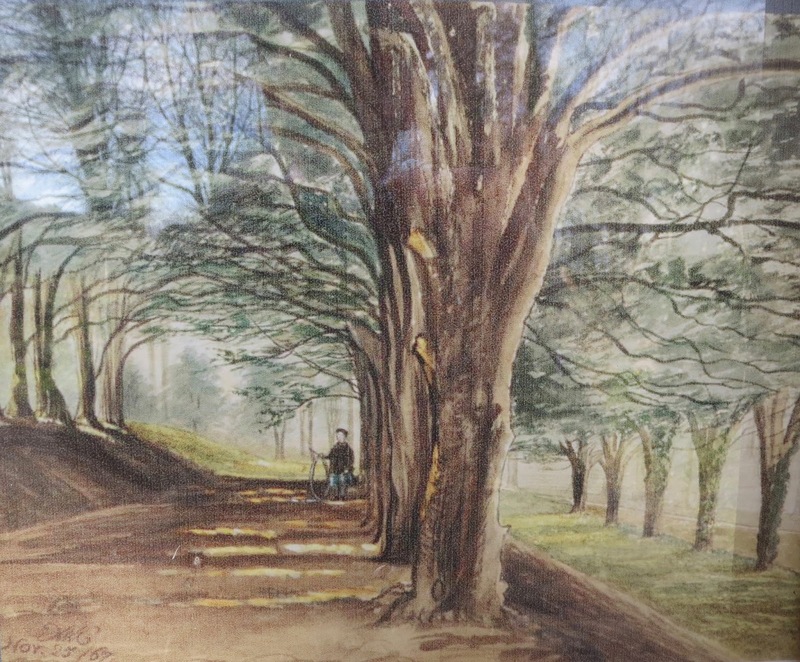 In the 1830s, Mr Cobbe sold the finest picture in his collection, a large landscape, in order to rebuild the houses on their mountain estates. It fetched £3,000 at auction, about £300,000 in today's money. Charles Cobbe died in 1857 and was succeeded by his son, another Charles. He, in turn died in 1886 leaving no male issue - his estate passing to his wife for her lifetime. Prior to her death she had persuaded Thomas Maberley Cobbe, a grandnephew of her late husband, to return to Newbridge from America to take over the estate. He died young in 1914 leaving two infant children, Thomas and Francis, the latter dying in 1949. Thomas did not marry and on his death, in 1985, he was succeeded by Francis's family, Hugh, Alec and Mary. IN 1986, Newbridge, complete with many of the original contents on loan, passed from the Cobbe family to Dublin County Council. The Cobbe family continue to reside at Newbridge House from time to time, due to a unique arrangement which had been entered into between the family and the Council. The family have use of what had been their dining-room for entertaining; and they can stay upstairs in their own bedrooms. On display in the coach-house is the magnificent state coach made in London, in 1790, for John FitzGibbon, 1st Earl of Clare, Lord Chancellor of Ireland and a relation of the Cobbes. The coach had been painted black until restored by the Irish National Museum to its former golden magnificence ~ even the fresco panels had been painted out, probably for the funeral of Queen Victoria. First published in April, 2011. The Musgrave family may be said to have begun their connection with Belfast at the beginning of the Victorian era. James Musgrave's father, Samuel Musgrave, was a general practitioner, who began there in 1799. Dr Musgrave was about twenty when he started his practice. His wife was Mary Riddel, a daughter of William Riddel, founder of Riddel & Company, Donegall Place and Fountain Street, Belfast. The Musgrave firm was an off-shoot of the Riddel establishment. The Musgrave family consisted of a dozen children. When Dr Musgrave died at Lisburn aged 66 in 1834, the family soon removed to Belfast and lived in Upper Arthur Street. By 1852 they were living at 1 Donegall Square South, and later moved to Drumglass House, Malone Road, which they built ca 1855. As young men, the brothers Robert and John Riddel were in partnership with their uncle, John Riddel, at 54 High Street in Belfast. With their brother James they founded the firm Musgrave Brothers and opened the establishment on the 30th May 1843 (which later became Richard Patterson’s of 59 High Street). Here the ironmongery trade was carried on successfully until expansion of business brought the manufacturing lines and, from 1860 onwards, this branch was conducted at the Ann Street Ironworks until a limited company was formed. John and James Musgrave were the principals, Robert having died in 1867. From this time forward the firm of Musgrave & Company Ltd created what was a new industry which attained world-wide fame with the manufacture of stoves, heating apparatus, stable fittings and high-class ironwork. John R Musgrave was the chairman and director, and represented his brothers' interests in the company. The expanding business now removed to new works at Mountpottinger. About 1854, the other brothers, Henry and Edgar, started the wholesale tea and sugar business. The Musgrave family were benefactors of the city of Belfast and its institutions: Sir James, when he retired, devoted a large part of his energy and abilities to developing the Port of Belfast, the possibilities of which he foresaw, the great scheme which he devised and which he lived to see completed. His name is forever linked with the Musgrave Channel which he did so much to further from the time he was elected chairman of the Harbour Board in 1897 until a year before his death in 1904. In recognition of these services the dignity of baronetcy was bestowed upon him. He also proved himself a firm friend of Queen's College (now University), where he founded the chair of Pathology which bears his name. Like his brother James, Henry gave many benefactions to the City. When the estate at Carrick, County Donegal, was acquired a similar bold policy was adopted. The Musgraves' old-fashioned courtesy and graciousness of manner, combined with a distinctive style of dress, gave the impression that evoked a link with the early Victorian period. Their unbounded generosity to charitable, educational and other worthy institutions will secure for them an imperishable memory. THE LODGE, Carrick, County Donegal, is a five-bay, two-storey, former country house or hunting lodge, built ca 1867 and extensively altered and extended ca 1910, having a central advanced single-bay projection to the main elevation. The main central block is flanked to either side (east and west) by lower wings having advanced gable-fronted single-bay two-storey terminating blocks with crow-stepped parapets over. A two-storey range of outbuildings is attached to the rear (north) of the terminating block to the west. 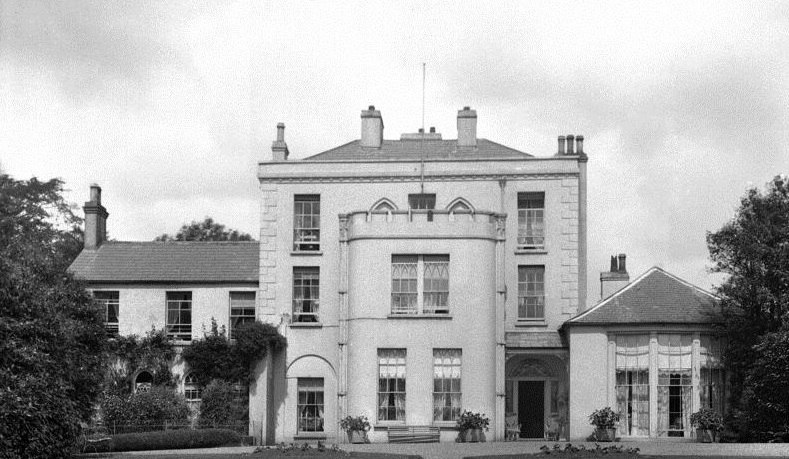 Carrick Lodge was extensively renovated about 1990, following destruction by fire in 1970. It is now in use as a private home. This substantial former country house or hunting lodge/retreat retains some of its early character and form despite modern alterations. The symmetrical front elevations is notable for the good quality "Tudoresque-style" cut stone surrounds with mullions to the window openings, hood mouldings to the ground floor openings and particularly by the striking crow-stepped parapets over the advanced blocks to the centre and terminating either end. The crow-stepped parapets are reminiscent of the Scottish Baronial architectural style, an architectural idiom that was popular during the Victorian period, and into the first decades of the 20th century, but relatively rare in County Donegal. These crow-stepped parapets were added as part of extensive alterations and extension to the house, around 1910, when the recessed wing and advanced gable-fronted terminating block to the east, and the projecting central gable-fronted bay were added. Prior to this, the house was a modest and plain two-storey building. Carrick Lodge was destroyed in a fire about 1970 and remained derelict until extensive renovations two decades later. It was originally built in 1867, when the Musgrave family purchased extensive lands around here in that year) and apparently replaced or incorporates an earlier house on the same site built sometime between 1836-47. 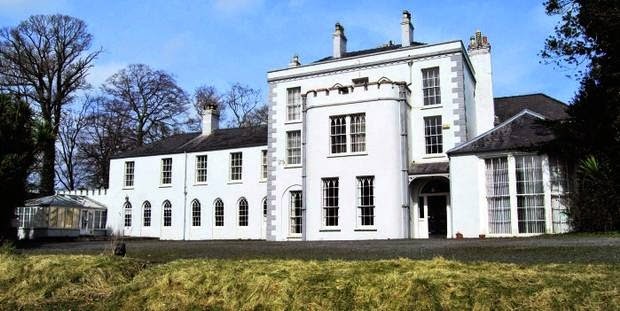 The Musgrave family had their main residence at Drumglass House, Belfast, which suggests that Carrick Lodge was originally built as a hunting lodge or retreat. 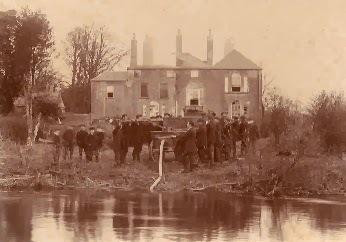 It was the home of James Musgrave (later a knight and a baronet) and John Musgrave in 1881, who were both Justices of the Peace; and of John Musgrave in 1894. 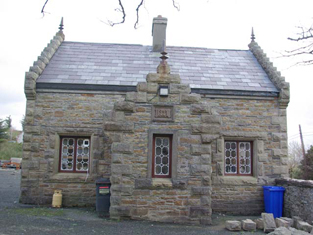 Although altered, this building is a striking feature in the dramatic landscape to the west of Carrick, and is an addition to the built heritage and social history of the local area. It forms a pair of related structures along with the attendant gate lodge to the south. The simple outbuilding and former walled gardens to the rear, and the gateways and boundary walls to site add to the setting and historical context. "The main reason we go game shooting is because it is fun. The thought of taking a day out to enjoy the countryside in the company of friends is reason enough for most of us to don our complicated tweeds, wrestle the shotgun from the cabinet and take on hours of driving to reach some far-flung corner of our islands. Bad weather, however, tends to take the wind out of your sails. Or sometimes firmly put the wind in your sails and the rain down your back. When you find any game shooting which puts a smile on your face in spite of the conditions, you know you must have found something of a gem. I was reliably informed that the week before my visit last October the guns had been taking on the impressive partridges of the Cleggan Shoot in their shirt sleeves. This was cold comfort for the guns on this occasion, who found themselves bracing against the wind, and squinting through the rain in pursuit of their quarry. In spite of this, you would be hard pressed to see a downcast face all day. The Cleggan Shoot lies in the North Antrim hills above the Glens of Antrim, facing the Mull of Kintyre. 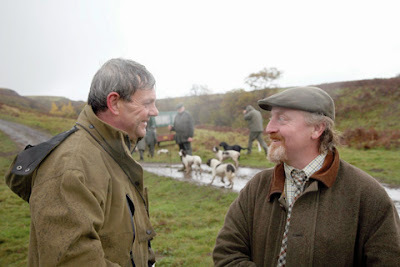 Partridge game shooting was started there in 2000, adding to the established pheasant game shooting. The estate provides five partridge drives and nine main pheasant drives, with a further 10 drives used for smaller driven days and walked-up game shooting. The attitude and atmosphere of the Cleggan Shoot is set by Lord Rathcavan, the estate owner, and shoot manager Joe Taylor. Both men have a clear love of game shooting and of the countryside, and they have built up a team of like-minded people who give the game shooting its unique, welcoming feel. They’re a great bunch of lads, you won’t ever hear a cross word said between them. I think in 10 years I’ve only had two people leave - and you were probably better off without them. I think that says it all. The game shooting is what brings you back, watching the game shooting and taking part by working the dogs. The teamwork here is great, it’s good fun and there’s never a bad word said. At lunchtime we get well fed and watered - it’s just an excellent day. The guns on the day were more than happy to buy into the party spirit, it being a rare chance for a group of friends from all over Europe to get together. “We came for the first time in 2009, and I’ve already booked up for next year. It’s a wonderful day out. For me it’s not just the game shooting which makes the day, it’s the whole weekend with the boys. We’re spread all over Europe, making it difficult to get together regularly. Game shooting is the perfect excuse and you certainly don’t get moaned at by your wife in the same way for going out to the pub. “I live 20 miles south of Zurich, it’s a lovely part of the world - absolutely magnificent. Switzerland is a very outdoorsy sort of lifestyle. We’re all closeted up inside most of our lives when you think about it, so any chance to get outside - even on a day like this when it’s pouring with rain - is lovely. You’re outside with the amazing landscape all around you, the air is fresh and you’re not surrounded by people and being pushed off the pavement. Each of the guns is put under the care of a specific picker-up who will watch and advise throughout the day. This is particularly important due to the terrain of the estate, which once used to hold large numbers of grouse, and presents the partridges in a similar manner. As such safety is paramount, which is reinforced in the briefing at the beginning of the day. The nature of the terrain, being high on various hillsides and in deep valleys, offers a real variety of shooting. Guns move onto the pegs quietly and are live immediately. The early birds do indeed burst off the hills like grouse, and the guns have to be ready to shoot them as such. 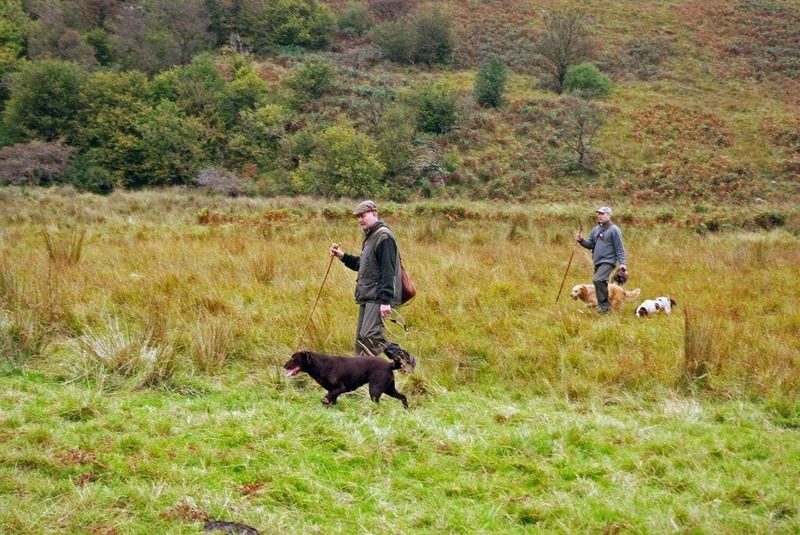 A long blast of a horn indicates the beaters are about to break the skyline, at which point the style of shooting changes and the drives become the more usual style of partridge shooting most guns will be used to. In spite of the heavy rain the birds were extremely strong, flying hard and fast in consistent numbers interspersed with large coveys. The birds are bought in as chicks from the first week of April, and sometimes even the last week of March, so by October they are already six months old. This extra time obviously gives them time to adjust to the conditions on a Northern Ireland hillside, as it is most unusual to see birds flying so well in such tough conditions. Both Joe Taylor and head-keeper Steven Baird have been working on the shoot for over 10 years, and deserve great credit for creating what is a very impressive shoot. 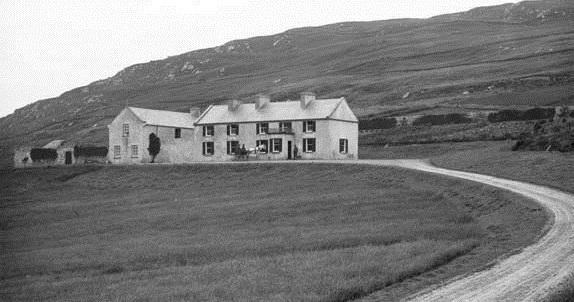 The main property on the 1,000 acres of the Cleggan Shoot, once a part of the vast O’Neill Estate, is an old shooting lodge. It was built in 1822 on the edge of what were then very extensive grouse moors. I always shot as a boy - though I wasn’t much good at it. My grandfather was a tremendous shooting man all his life. He was the youngest son, and so bought Cleggan from his father in 1927. 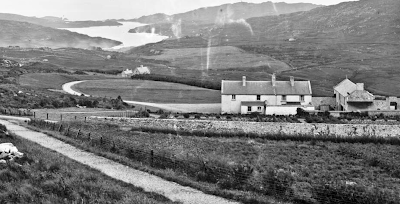 It remained part of the O’Neill estate in spite of the Land Act of the 1870s because shooting properties were exempt. All the shooting rights still belong to my cousin, who is the present Lord O’Neill. A real highlight of the day, and one of the key criteria for judging any shoot, is the food on offer. Lord Rathcavan was the proprietor of the Brasserie St Quentin on Knightsbridge, whose sign now hangs in the guns’ lunch room. “Shooting is about a lot more than just the shooting,” Lord Rathcavan explains. “The problem with being out here in Northern Ireland is we can’t hope to compete with the biggest shoots in England and Scotland, particularly the west country partridge shoots. As such we have to offer something different. One of the ways we do that is the cultivation of the special atmosphere we have here, a big part of which is our lunches. “I buy the beef un-butchered from the local meat factory, making sure it’s all hung for 28 days. It’s so much better to see beef on the bone. I get the rib and stick it in the Aga at nine in the morning. After an hour or so I cut the skirt off, which then goes in the beater’s oven with the two big hunks of shoulder they have cooked in their oven in their shoot room. “I take the meat out of the oven at 12 and let it rest on top for about an hour, which is the most important part. Isabel is our lunch steward, the most wonderful girl who does all the other bits of cooking. The guns get a good wine, and the meal ends with a cheese board. “So many people come back here just because of our lunches - it’s all part of the camaraderie of the day. You can always judge how good a day people are having at lunchtime as it’s their first opportunity to mull over the shooting. I think it’s all part of the experience." Good though the food is, the quality of shooting on offer is not to be underestimated. Thanks to the varied terrain there is a wide range of sport on offer, from driven partridge and pheasant days to smaller boundary days and walked-up woodcock shooting. Shoot manager Joe Taylor (left) & Gavin Whittley discuss the morning’s drives. Unusually, the partridge shooting is charged on a fixed rate at £6,000 for a day on the basis of 300 birds. Though most guns will be used to being charged on a per-bird basis, the flat fee actually works out as extremely good value, coming in at about £20 per bird. Considering the quality of sport on offer, even in the rain, this seems like a bargain to me".